8TH FLOOR EMERALD BEACH RESORT! SUPER KID FRIENDLY POOLS AND A FREE GAME ROOM! 8th Floor GREAT VIEWS . GREAT KID FRIENDLY RESORT ! King Bed and the Bunk Beds Have NEW Mattresses.. New Stove/Refrig. 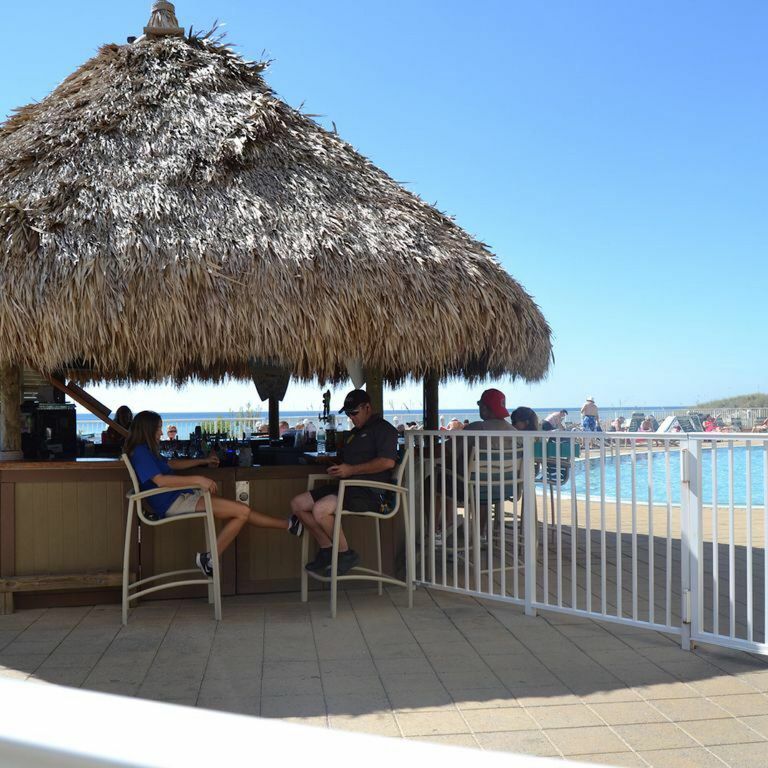 Large Oceanfront Pool, Hot Tub.Tiki Bar Is Seasonally OPEN. Big 'Kiddie Pools' With Buckets That Dump Water. Kids LOVE These Pools. FREE Game Room Next To The Pools ! Emerald Beach Resort is Very Convenient to The Pier Park Shopping District, 1 Mile Away..Walk To Funland, Gulf World, And Sharkys. Starbucks in The Lobby. Several Restaurants Less Than a 5 Minute Walk. You Will Be Thrilled At The Quality/Value/Pricing Of ALL Our 10 Units. We Manage Them Ourselves, Thus NO JUNK FEES ! We Own 5 Luxurious Condos, All Up and Down Panama City Beach.We Are Meticulous About Having Our Units CLEAN ! All Our Condos Are Very Upscale, And the Quality/Value We Offer is Amazing. We Constantly Go To PC Beach to Oversee ALL Our Condos. You'll Be Impressed By What WE Have To Offer! We Couldn't Believe How Awesome The Ocean Water Looked When We First Saw PC Beach. The Water is Often Clear Blue/Green, Like the Caribbean. We Sold our Place in Savannah, and Fell In Love With PC Beach. We Were Surprised With How Reasonable We Could Rent Condo's on the Beach, So We Began Investing in Oceanfront Property Here in 2006. We Own 5 Condos In PC Beach. ALL Are On VRBO.com..Listing Numbers Are Below. To See Them Go to The VRBO site.. Type In The Listing Numbers In the Search Bar... Then Hit The Search Button ..(1BRs): 922921, 4860484, 4860512, 4967095. (2BR): 4827494 ...CALL US 706-254-2569 ! WE OWN AND MANAGE THESE ! Dining Room Table. Extra Seating at Bar Area. FunLand Arcade Across Street. Walk to Sharkys Restaurant and Gulf World. 1 Mile to Pier Park. 2 GREAT 'Kiddie' Pools With Water Features. We Own 5 Condos In PC Beach. ALL Are On VRBO.com..Listing Numbers Are Below. To See Them Go to The VRBO site.. Type In The Listing Numbers In the Search Bar... Then Hit The Search Button ..(1BRs): 922921, 4860512, 4860484, 4967095. (2BR): 4827494. CALL US FOR SPECIALS @ 706-254-2569 ! WE OWN AND MANAGE THESE ! Great place, had everything we needed and the kids loved the bunk beds. Our condo was clean, comfortable & had all the necessities. Enjoyed the awesome gulf view daily! Nice place to stay overall. It was somewhat no frills however. Why not provide 2-ply toilet paper and fluffier towels? The bed sheets were well worn and had an old school coffee maker. Did have a comfortable bed and having two bathrooms was great for my wife and I. Nice view of the gulf with opportunity to see sunsets. Very awesome! Location by the elevators was not ideal, very noisy all night long. And one last criticism, the place could be cleaner and have professional paint job. Baseboards were quite grungy as well. Although we would stay at the hosts places in the future, we would not return to this Florida location since it did not offer much entertainment for us. We realize that we did come during the off season, there was not much open around the area. Could not even play mini golf. Every Month or So, New Sheets Replaced, Would Have Brought New Ones, Had We Been Asked. Spring Break is very vibrant for the younger crowd Emerald Beach is a Very Kid Friendly Resort. In March, everything is open all up and down the Beach. This is a very high demand resort and a very high demand condo, one of multiple units we own here. It's common for the baseboards to have some black marks from luggage carts. No idea what you meant by' professional' paint job. Probably, a much older couple like yourselves would be better served in a more 'adult only' part of the state, something like the Miami area. There are LOTS of things to do in March in PCB, it's a Very Popular area of the State for the Younger Family type crowd. The condo was equipped with what we needed for a weekend stay. Master king bed was very comfortable. Mike was very quick to respond to any questions we had. Would certainly stay again. The pools were heated, the staff was pleasant, and the location was perfect! Pier Park 1 Mile Away !